Political season is in full swing—conventions, debates, commercials, attack ads—everything we all love and never tire of (sarcasm) is here for the next four months. Music and politics can go hand in hand, sometimes causing a stir when permission isn’t given to use a track or clips from a band. Today’s album was controversial years back, but for different reasons. 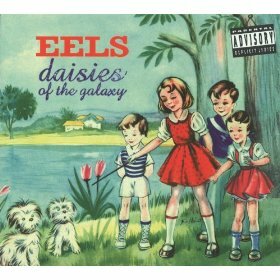 A couple years back, I talked about one of my favorite bands of all time, the Eels and their debut album from 1996. After seeing some success with it and lead singer E felt he finally had “made it,” tragedy struck his life in an unimaginable way. E’s sister took her own life after battling depression and mental illness for many years. While back home in Virginia helping with the funeral and being there for his family, something seemed off with his mother. They found out she had lung cancer and she passed away in 1998. Following those brutal couple years, E’s only outlet was to write another album to vent his feelings. So 1998 saw the release of “Electro Shock Blues,” which was so incredibly raw and emotional, it almost didn’t get released by the label. Thankfully it did, and has been called “brilliant” and “a classic on all levels” by critics. Because of the dark nature of the sophomore release, their third album “Daisies Of The Galaxy” had a much more upbeat feel to it. Released in February of 2000, it was a “pop” album that was a polar opposite of the other pop at that time. If popular music was meant for teens during those early 2000’s, this was pop music for adults. The album had meaning and substance, but one group took issue with that stance when it was handed out at the 2000 Democratic National Convention. In fact, it caused major uproar. Bush campaign spokesman Ari Fleischer said the combination of the adult lyrics and child-friendly cover art “shows that America’s families and parents cannot count on Al Gore to stop Hollywood from marketing this stuff to children.” The band wasn’t even aware the album had been handed out at the luncheon the label had sponsored. The contrast in styles album to album is partially what really draws me in to this band. No two albums sound alike—and when you see them live, no two performances are equal either. While this album is more along the pop lines, it’s certainly not Britney or boy-band fodder. Following such a deep album, this is almost like E took a collection of songs from various notebooks and mashed them together. It forms a great 15-track record, covering various genres along the way. The hidden track “Mr. E’s Beautiful Blues” was featured in the film “Road Trip” with a music video even featuring the actors. For anyone that knows E, that’s not his style, and he wrote about how regretful he was of agreeing to do that in his book. It may have sold a few extra albums though, and expose some to their music that may not have otherwise, so it’s not all bad. While I am clearly biased, this is a solid album. I celebrate their entire catalog, but if you don’t, this is a good one to start with. And for $5 bucks, give E a chance! Editor’s note/full disclosure: As Austin points out, this is pop music for adults, hence the parental advisory warning (for only one song though).